Providing you the best range of motorized damper with effective & timely delivery. We have marked a distinct position in the market by providing a high quality range of Poppet Damper. 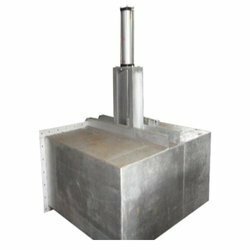 This damper is widely used in various industries like cement, chemical, steel, food processing and many others. Used for controlling exhaust gas flow, this damper is manufactured using premium grade raw material with the help of sophisticated technology. We offer this Poppet Damper in different specifications to match up with customers' specific requirements. Looking for Motorized Damper ?